Cape Town - South African duo Branden Grace and Justin Harding won their opening group matches at the World Golf Championships-Match Play. Grace prevailed over Japan's Hideki Matsuyama 4&3 and will face world No 1 Dustin Johnson on Day 2 at the Austin Country Club. "It's going to be a tough match ... It's going to be good," Grace told the PGA Tour website. "If I keep doing the same things that I've done today, ball-striking was a big key ... I'll head to the putting green. I missed one or two little short ones. So if I can get that under control, I'll be there." The in-form Harding took down Englishman Matthew Fitzpatrick 1-up. However, the South African will have his work cut out for him when he battles world No 4 Rory McIlroy on Thursday. "I'm going to have to improve a little bit to take him on," Harding told the PGA Tour. "Rory's been playing great over the last couple of weeks. It will be a nice opportunity for me to see how it's done inside the ropes, and maybe learn a little bit as well, and give the boy a little bit of a challenge." 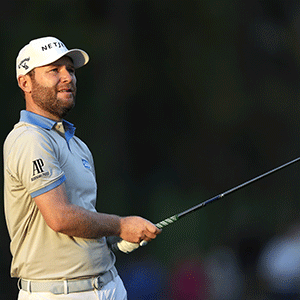 Meanwhile, SA's top ranked golfer Louis Oosthuizen lost 3&2 to American Kyle Stanley. Oosthuizen will be desperate for a win on Thursday when he takes on South Korean Byeong Hun An as it's impossible to advance out of the group stage with two defeats.